Photo used with permission from heumlich.at. In the ancestral health community raw milk and milk from grass-fed cows is highly praised. See Chris Kresser for an excellent overview of the benefits and the small risks of raw milk. Mark Sisson gives a nice overview of the more healthy fat composition of pastured butter. It took me some time to understand the situation in Germany, until I knew the two magic words: Vorzugsmilch and Heumilch. Raw milk is not pasteurised and not homogenized. Pasteurisation is quickly heating and cooling to reduce the bacteria concentration. Milk is white because of all the small fat droplets in the water. In homogenization, milk is pressed through a valve at very high pressures to make the droplets smaller, which prolongs the time until the droplets combine to form cream at the top of the milk. In Germany, retail of normal raw milk is forbidden, but a farmer is allowed to sell his raw milk directly to consumers. Raw milk sold in shops is called Vorzugsmilch, let's call it merit milk in English, I like alliteration. Cows and farms producing merit milk are inspected regularly and the milk has to get to the consumer within 96 hours. According to Andrea Fink-Keßler (agricultural scientist) the diet of the cows producing Vorzugsmilch is similar as for hay milk; see below. It is not easy to get, but in Bonn, you can get it at two organic supermarkets (Bergfelds in Bad-Godesberg and Momo in Beuel). Half of the farmers have formed a union, on their homepage you can find the addresses of the farms, so that you can ask for information on shops in your neighbourhood. In many other European countries, unpackaged raw milk can be sold in supermarkets. In some states in America raw milk is illegalized. For these states, the merit milk system with stringent inspections may be a sensible political compromise. I have not found a supplier of pastured milk yet. What you can get is Heumilch, hay milk. This is milk from cows fed mainly grass and hay, but also some grains and lupines. Forbidden is silage, fermented grass and other plant materials. 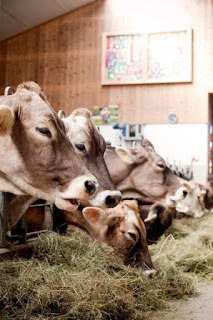 According to the Austrian farmers union that markets hay milk, also hay milk contains a much better quality of the fat as conventional milk: more Conjugated linoleic acid (CLA) and a better omega 3 to omega 6 fat ratio. In this respect is seems to be quite similar to milk from pastured cows. It would be interesting to study whether the quality of hay milk is the same as that of pastured milk. If it is, it would be ironic for the paleo community, as the diet of the cows producing hay milk conflicts with the paleo dietary recommendations, with their aversion of grains and love of fermented foods. But then, cows are not humans, the amounts of grains are not large and humans and cows thrive on very different diets. In Bonn, I found cartons with hay milk at the Basic organic supermarket (Gangolfstraße; central bus station), which even has a DEMETER seal, one of the most strict organic certifiers. UPDATE: Now also the Alnatura supermarket (in Bonn behind the main station) has hay milk (in a designer Tetra Pak). I have no digestive problems with conventional milk in normal amounts, and it needs time until you notice the advantages of the better fats, thus all I can say for both the Vorzugsmilk and the Heumilch is that it tastes well. A comparison of the main ideas and recommendations of these two lifestyles. Some ideas for natural ways, which helped me cure or reduce asthma. Differences in sleeping times, from early bird to night owls, may provide security advantages. A critical comment on an article, which states that humans have an intrinsic propensity to eat too much. Forcing children to learn stifles their innate motivation to teach themselves and may thus be counter productive. Is Hay-milk or vorzugsmilch available near Freiburg? I would expect so. Isn't Alnatura from your region? Amber, welcome to Bonn. It depends where you settle in Bonn. But nearly every quarter has a decent sized ecological supermarket. If healthy food is important to you, you will enjoy Germany.